This article provides instructions to configure Chrome Enterprise, previously known as Google Chrome Device Management (CDM), for Chromebox devices. Google Admin credentials with a G Suite (Google Apps) account. Please note the specific configurations required by Appspace, stated in each step. Leave all other settings as default. Create a new Organizational Unit (OU) for Users by following the instructions in the ‘Add an organizational unit for users’ section in the following article: https://support.google.com/a/answer/182537?hl=en. 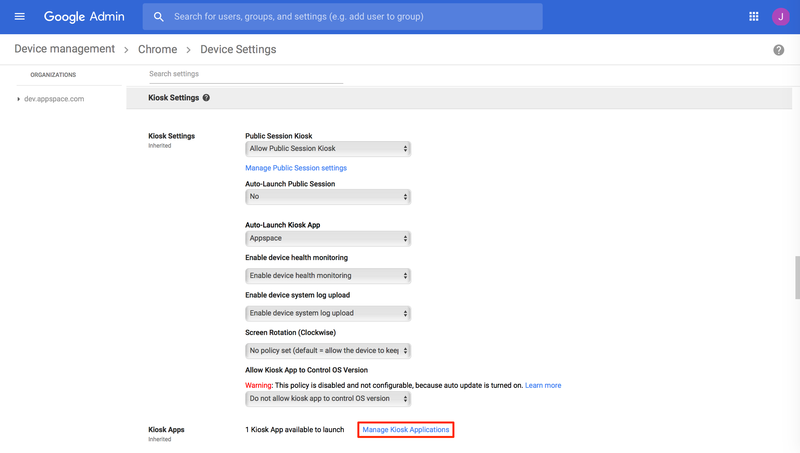 Configure the Public session settings by following the instructions in the ‘Public session settings’ section in the following article: https://support.google.com/chrome/a/answer/3017014?hl=en&ref_topic=2935995. Follow the instructions in the ‘Manage device settings’ section in the following article: https://support.google.com/chrome/a/answer/1375678. Click the Manage Kiosk Applications link. In the Kiosk Apps window, click Chrome Web Store, and search for “Appspace”. Click the Add link next to the Appspace app. In the Auto-Launch Kiosk App drop-down menu, select ‘Appspace’. You may choose to enable device health monitoring and device system log upload, if desired. Configure the User Settings by following the instructions in the ‘Set Chrome policies for users’ section in the following article: https://support.google.com/chrome/a/answer/2657289. Setup the Kiosk mode as per instructions below. Enroll the device by following the instructions in the ‘Manual enrollment’ section in the following article: https://support.google.com/chrome/a/answer/1360534. The device must be brand new for this to work. If you have previously signed into the device, you must perform a factory reset before the Enterprise Enrollment can work. The device will begin to download the policy settings and kiosk application. Once this is complete, ‘Restart’ is displayed in the bottom left menu, instead of ‘Shut down’. Click Restart. The device reboots, and launches the Appspace App. Your device is automatically registered. The table below provides a description of the features in Chrome Enterprise (Chrome device management). Reboot Reboot device on-demand and on schedule. Yes, on-demand reboot request can be sent to specific devices running Kiosk Apps, or via OU policies. Run Application with Parameters Start application, with set of parameters. For auto registration to Appspace. Yes, via config file. Crash Report Detect application crash, and relaunch via email. Yes, crashed app will restart. Application freeze will remain frozen. App Control Push different applications to different devices based on predetermined groups. Yes, based on OU. App Updates Push application updates to one or more devices from a central location. Not on-demand, updates go through at next reboot. Automatic Login Automatically log into the device and launch an application, or launch an application within login. Yes, application required to be a Kiosk App, and will be launched before login. NTP Set up NTP server and timezone on devices. Supports 5h timezones. No, Google Time. Device requires specific list of websites in order to function correctly. Screen Rotation Rotate the screen to support portrait mode applications. No, unable to be done via policy.